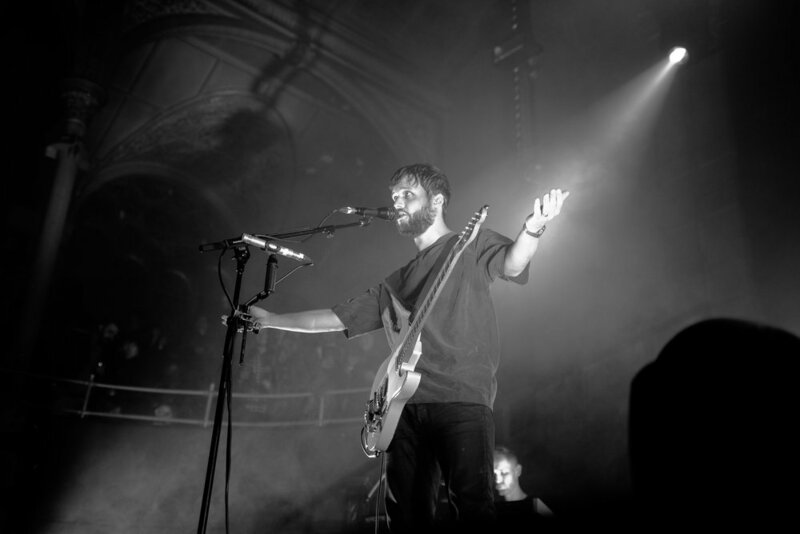 Touring extensively across the UK and Europe in support of new album ‘Five’, White Lies brought their perfected live performance to Manchester for a sold-out show at Albert Hall. Replying to a Tweet posted by the venue about set times ahead of the show, White Lies announced they would be “sneaking on a bit earlier” due to their “fairly massive set these days”. Meaning their set time was brought forward to 8:15pm, probably the earliest a headline band has played on a Friday night in Manchester for a long time! Support came from Boniface, a Canadian band previously unknown to me, but seemingly not to a lot of the crowd, who were wearing the bands merchandise and dancing along. The whole band has a real 80s aesthetic going on, from the font on the drum kit, to the frontman’s suit, to their promo photos posted on their growing social media pages. It’s like a real-life William Eggleston photograph or a look back in time to the American Dream, they’re making a real brand and like many others, I’ve fallen for it. Fans came down early to catch Boniface, who are named after a small town in Winnipeg, Manitoba. If frontman Micah Visser hadn’t admitted that “this is special to us, this is by far the biggest venue we’ve ever played”, then we would never have guessed. 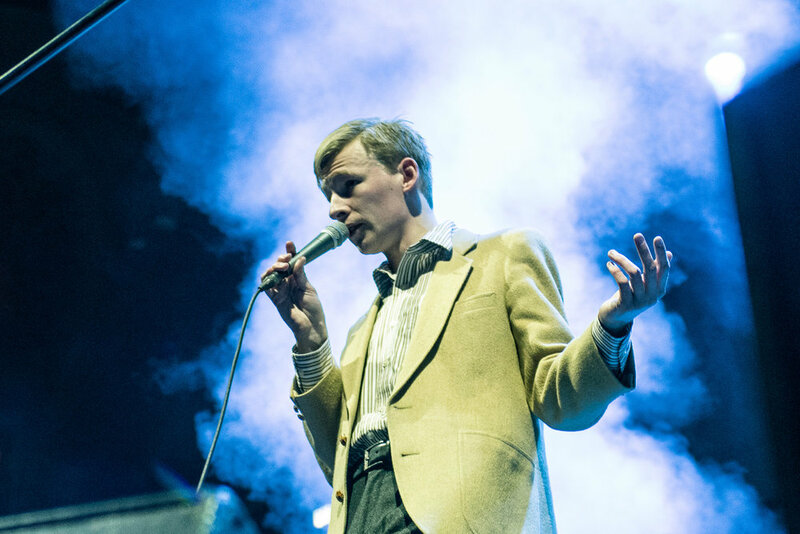 Boniface suited the venue, confidently owned the stage and brought in a large crowd for their early support slot. Well done Boniface, you’ve gained a new fan! Recently announced as support for Blaenavon, be sure not to miss that tour if you want to catch Boniface before they’re playing their own headline shows. With the venue now packed, it was obvious the word had got around about the early set. Before heading on stage I caught a glimpse of the band having a group hug with genuine excitement on their faces, it was a wholesome moment, one that reminded me exactly why I love this band. 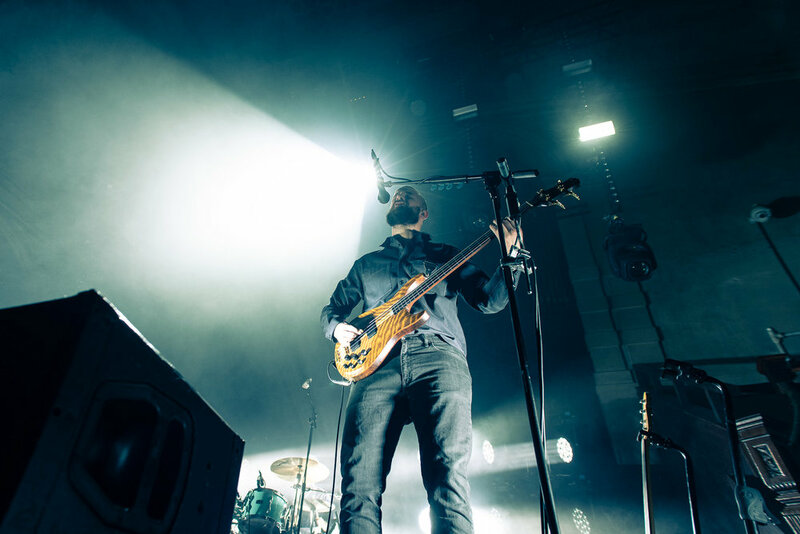 Going straight into lead track from latest release ‘Five’, White Lies spent the duration of the 7-minute song under blue lights. ‘Time To Give’ warmed up the crowd for what was soon to be a show filled with only their best material, spanning five albums. As the blue lights lifted the band went into debut album track ‘Farewell To The Fairground’ and followed with recent single ‘Believe It’. 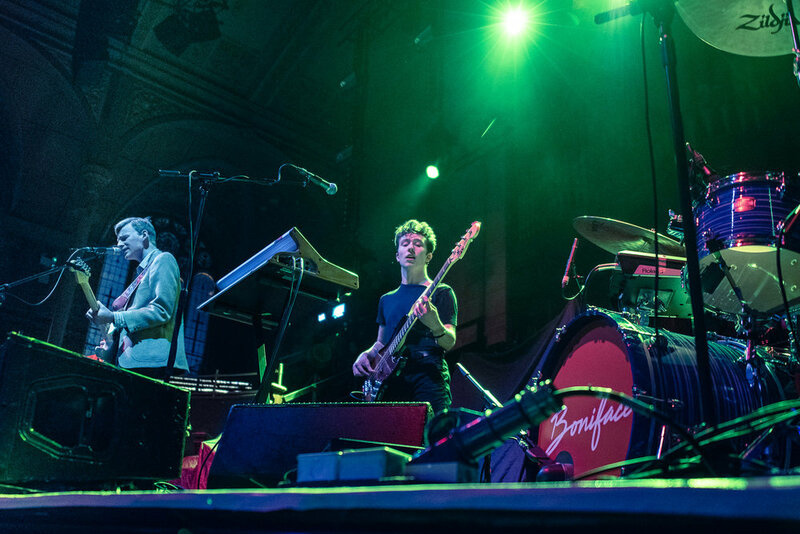 The three-piece band, who are celebrating 10 years since the release of their debut album, were accompanied by an extra member on keys for their live set. 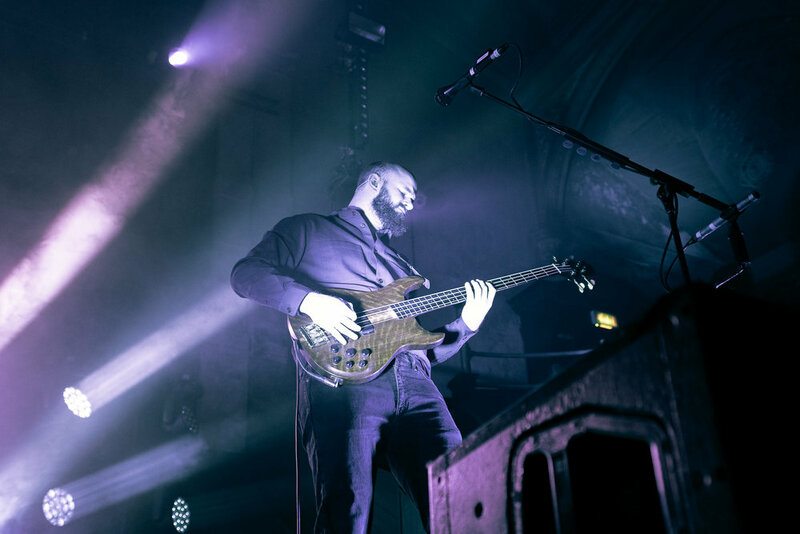 White Lies have the ability to capture everyone’s eyes as they mesmerise the audience with haunting singles from their debut, but they also have the power to have a whole room dancing and singing along to every word of their more upbeat tracks. ‘There Goes Our Love Again’ is one of my top 5 White Lies songs, it’s energy throughout and repeated chorus makes it a real crowd pleaser. Two more songs with ‘love’ in their title followed, ‘Is My Love Enough’ and ‘Hold Back Your Love’. In fact, ‘Five’ is their only album to date that doesn’t have at least one song with the word love in the title - pub quiz stuff that is! The band continued through their back catalogue, pausing only for huge cheers and applause. As we know, singer Harry McVeigh isn’t much of a talker, but tonight there really was no room for in between song chatting. He didn’t address the crowd until introducing ‘Unfinished Business’, their first ever single released in 2009. Stand out tracks from their new album included ‘Jo?’, ‘Tokyo’ and ‘Never Alone’, which were all extremely well received and saw the crowd singing and dancing along. Playing every song off ‘Five’ apart from one, White Lies proved that they are still capable of making bangers 10 years on from their debut, ‘To Lose My Life’, which just so happens to be one of my favourite albums of all time. ‘Death’, went down an absolute storm, with a fast-paced rendition of ’To Lose My Life’ having a similar reaction. “Manchester we love you so much, thank you“. 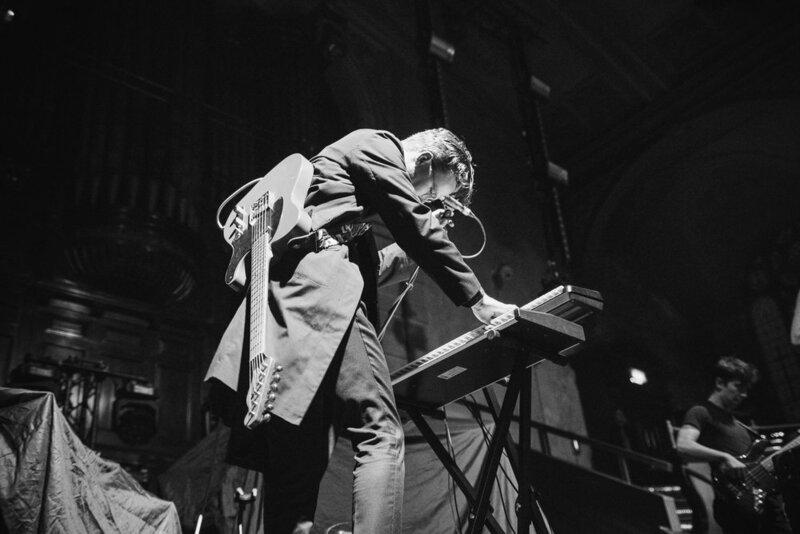 It wasn’t long before Harry McVeigh appeared back on stage for an encore, the blue lights where back as he took to the keyboard to play ‘Change’. This was a new element I haven’t seen in their live show, as it’s been a long time since I saw them at a headline gig, and it was in this moment I realised this band are so worthy of headlining festivals (Thursday night Y Not goers you’re in for a treat). 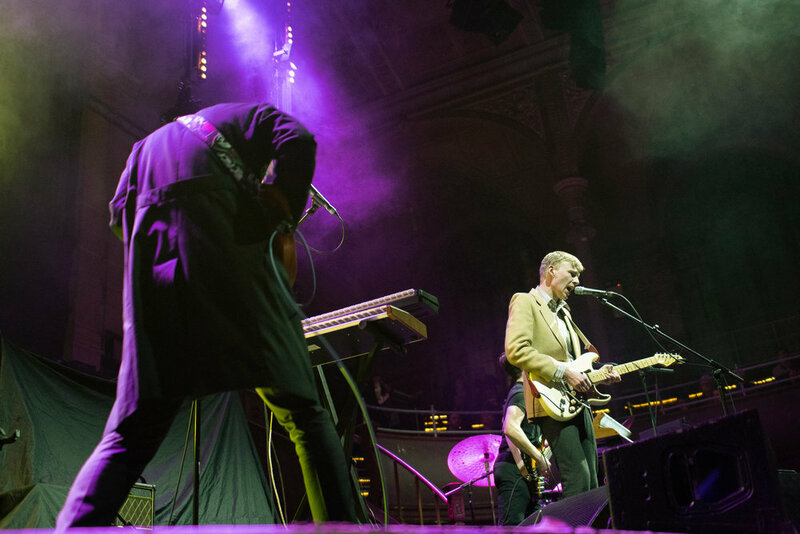 Their live performance is well refined, with the atmospheric lighting and hollow vocals fitting Albert Hall perfectly. The rest of the band returned to the stage to perform two final songs. ‘Fire and Wings’ and usual finale single ‘Bigger Than Us’ saw the crowd have one last singalong. This was a special evening, with the audience feeling united as good vibes bounced around the room. A final bow to all angles of the audience saw the band beaming with smiles as the set came to a close. There’s not many bands, where five albums in, you can still see them in such an intimate venue. As one of the best live bands around, White Lies delivered a 110% passionate performance, as usual.